2013 has been a year of solid recovery across most capital cities in Australia. National property prices have greatly outperformed the previous two years and we began to see real signs of this throughout Q3 of 2013 paying particular attention to Sydney which seen record clearance rates and stock levels. 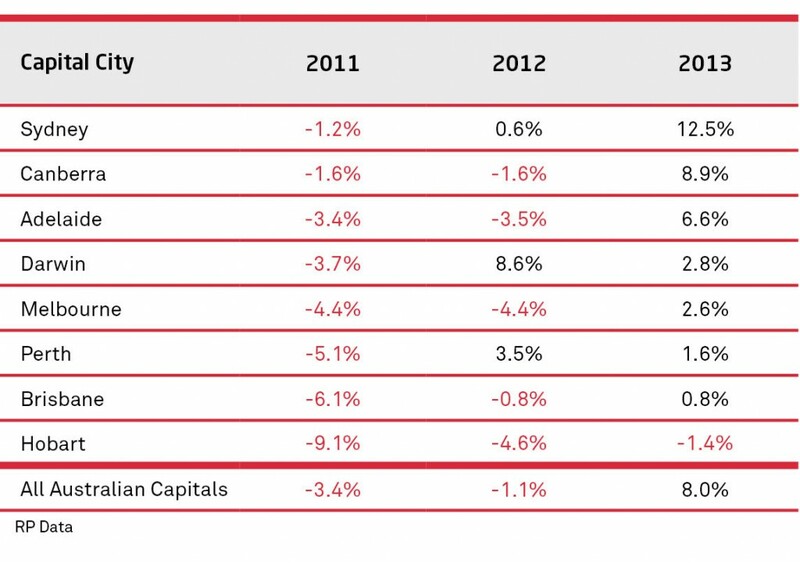 According to RPData the only two capital cities that did not perform better in 2013 where Perth and Darwin. All the signs are pointing to 2014 to be a strong one and below are a few reasons why. The long and perhaps pain staking lead up to the federal election dampened business and consumer confidence for the best part of the year, however with the election now far in the review, confidence has appeared to strengthen dramatically practically within in the business community. Both the USA and Europe are beginning to show signs that the worst is over, unemployment rates have dropped and there is a consensus for a brighter outlook for 2014 which will have a positive effect on confidence moving into the new year. Banks have been far more lenient in lending money throughout 2013 this availability should continue as the Australian economy continues to improve. With a greater demand for money this will subsequently increase demand for property which in turn will push prices up, however should interest rates begin to rise sooner rather than later, as there has been some speculation of, this rise in the cost of money will be one of the biggest influencers in the market. Interest rates are at historical lows. As mentioned before the instability in the political realm throughout the first 3 quarters of 2013 was a concern to both investors and owner occupiers being cautious, this has impacted the number of people entering the market and now confidence is beginning to return and property prices are rising, people are realising the potential. « To turf.. or not to turf?